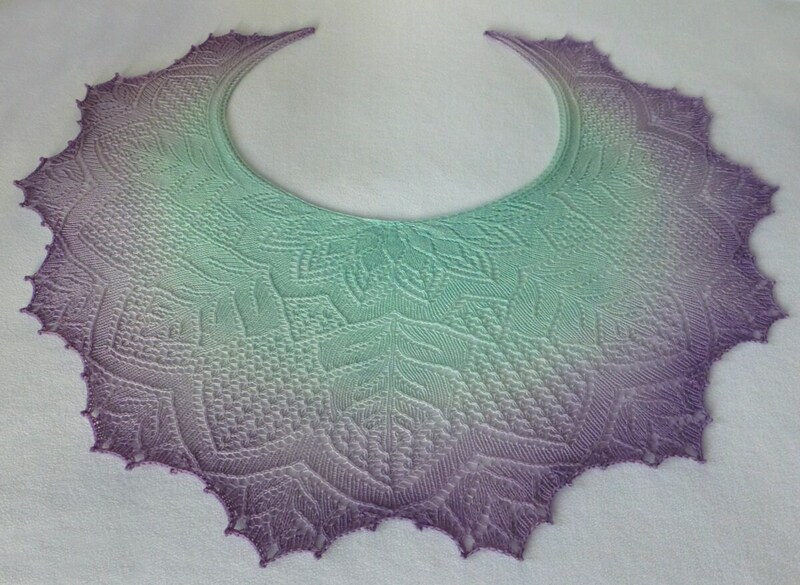 Gorgeous Ice Maiden shawl in Green to Purple Gradient Merino. Frost permeates the air as this Ice Maiden shawl longingly awaits Mother Nature's magic; its icy green to purple gradient lending a hint to the colors of Spring. Wrapped in the warmth of Merino and nylon, this shawl will chase away any remnants of winter. The perfect accessory for those cool evening s or chilly morns not yet warmed by the summer sun. Color: Mint green to purple gradient. Size: One size (S - XL), Measures 48" wide by 24" long. Material: 80% Merino, 20% nylon. Gently hand wash - Lay flat or dry clean. *Special thanks to Anna Victoria (Forest Maiden Lace Shawl) for creating such a wonderful pattern and Wollelfe for dyeing such lovely yarn. Dazzling Across the Universe gradient shawl in BFL and silk. Gorgeous Wild Swan Gradient Shawl in BFL and Silk. The yarn for this shawl was custom dyed for me by the owner for a very specific shade of green, and it is so beautiful! I am so grateful for her skill and artistry! Thank you, thank you! Beautiful and silky shawl. The feel and drape of tencel is wonderful. Expertly knitted! A truly beautiful piece of art! Love it! Clearly I need to have more sparkle in my life, and this little beauty will bring it! Such a beauty! I always wear soft colours, but this brilliant shawl will inspire me to be bold. And perhaps go back to dancing the Tango! Most hand-knit, wool or wool blend items do best when hand-washed and laid flat on a towel to dry. Some types of yarn can be machine-washed and dried, but the item shows wear and doesn't last nearly as long. My recommendation is to always hand-wash.
Are your items ready to ship. Yes. Everything listed in the store has already been created, washed and blocked, and is packed away in a storage bag, ready to ship. Only custom orders take a few weeks to make. The colors look different than my monitor showed. Can I return it? Yes. I can't cover your return shipping costs, but I will refund (within 30 days of purchase) the purchase price of any items shipped back to me in the same condition I've sent them to you in. Monitor color varies and I try to write a description of the actual color to help with this, but there's nothing more frustrating than buying something that doesn't match what you were buying it for. Lace-knit shawls and cowls use a finer weight yarn. They are very light and open making them perfect for summer wear, or indoors where the temperature is a little too chilly for comfort. Aran-lace shawls and cowls use a heavier weight yarn, are more sturdy, and are more suited to cooler climates or winter-time wear.